This is a guest post by Patrick O’Mahen, a fellow at at the University of Michigan’s Weiser Center. Last week, The Monkey Cage highlighted new research by Stuart Soroka and colleagues, suggesting that watching public broadcasting increases political knowledge. In his comments, John Sides noted that the problem in the United States is that few people watch public broadcasting, limiting any practical benefits. My own research concurs with and extends both Soroka and colleagues’ conclusions and Sides’ practical criticism. Watching public broadcasting not only seems to increase political knowledge, but also reduces knowledge gaps between haves and have-nots. However, historical development of national broadcasting systems awarded first-mover advantages to public broadcasters in most European countries and commercial broadcasters in the United States. As a result, public broadcasting in our country has always faced an impossible uphill fight against established commercial networks. But I have a modest proposal that might help. As Soroka et al. 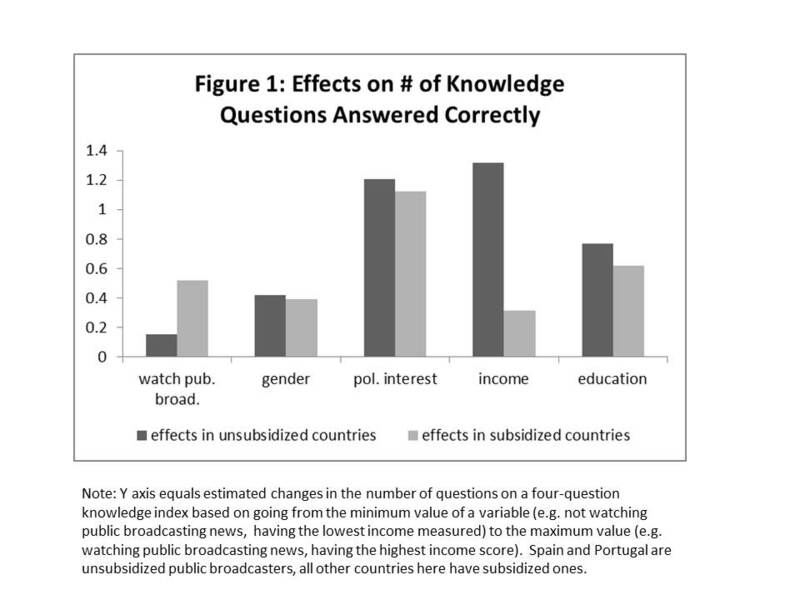 conducted their study, I independently found that across 14 western European countries, watching public broadcasting increases correct answers to political knowledge questions by roughly 12 percent, but only in countries that subsidize public broadcasting. That both studies generated similar results at different points in time, using different data, with different countries and different methods strengthens the argument that public broadcasting increases political knowledge – although questions about correlation vs. causation remain. But even if public broadcasting increases knowledge, this may be less salutary news if this increase is concentrated among the relatively rich, well-educated people who already are politically knowledgeable. In this case, public broadcasters would actually worsen political inequality – not a catchy slogan for an NPR pledge drive. Score one for Mr. Snuffleupagus. However, that happy result leaves the problem that Americans rarely consume public broadcasting. The good news is there is a proven way to ensure a long-term influence and a large audience of public broadcasting. The bad news is that the time to implement the solution was in 1927. As I argue here, the initial conditions under which broadcasting systems formed in the 1920s and 1930s determined how much sway public broadcasters have nearly a century later. For example, Britain awarded a public national broadcaster a monopoly on the airwaves, which froze out commercial broadcasters from the early development of radio. 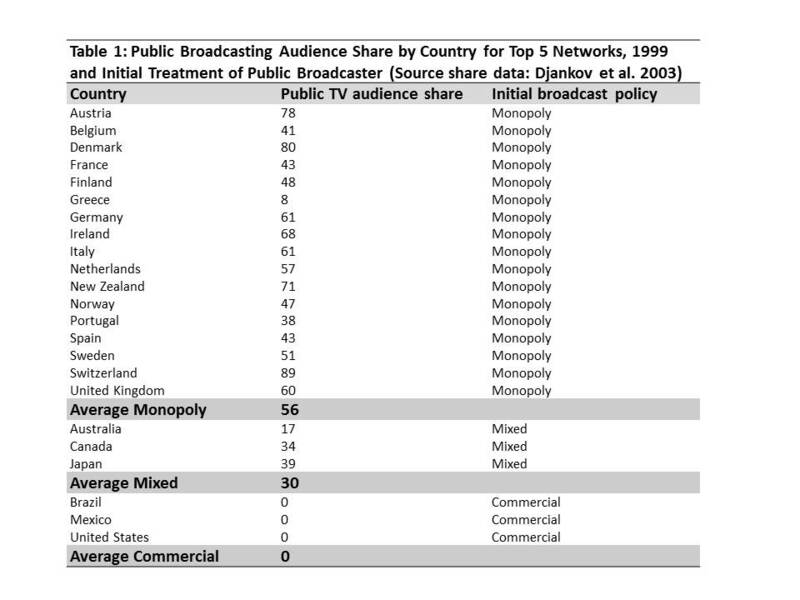 With a monopoly, the public broadcaster easily dominated early development and gained a massive first-mover advantage in broadcasting. In contrast, the United States declined the opportunity to develop a national public broadcaster and let commercial broadcasters dominate early development, although thriving non-profit and public interest sectors survived into the late 1920s. When Congress did finally move to regulate the industry under the Radio Act of 1927, the regulations sharply favored commercial broadcasters and banished public broadcasters to the dusty low-power corners of the spectrum. Canada’s policy found a middle ground. Commercial broadcasters dominated the early development of radio. But when the government regulated the industry in the early 1930s, it moved to counter American cultural influence and to improve service of rural Canada by creating a national broadcaster. However, the commercial broadcasters had enough influence to retain their existing frequencies. In all three countries, the early move created a self-reinforcing system. Listeners grew used to and supported the status quo. Technical expertise developed within the existing broadcasters, leaving them better able to pioneer new technology, such as television. Finally, the dominant interests in each country were able to influence government officials as they developed new broadcasting policies. Despite the disadvantages that public broadcasters have faced in the United States, there may still be a way to encourage public broadcasting. Instead of developing yet another TV channel or website, perhaps we should try the philosophy of advertisers. Create a news organization (I’ll call it NewsComm) to research and produce 30- to 90-second story blocks that can run during commercial breaks on television and as pop-up or banner ads on popular websites. NewsComm would be funded by an endowment raised from one-time donations by charitable organizations, university systems, states, localities and individuals, matched from the proceeds of a temporary federal sales tax on televisions, computers, smart phones and other electronic devices. The organization could be run by a board of governors named in equal proportions by the federal and state governments, non-profit donors and by the journalists employed by the organization. Federal employee scales could set standards for compensation. NewsComm seems unorthodox, but it builds on political advertising’s success in educating viewers. Colleges, states and foundations already fund public broadcasters in the United States, while a tax on electronic equipment has been used in other countries to fund their public broadcasters. The beauty of NewsComm is that the government finances are short-term levies to build an endowment, which shields taxpayers over the long term and ensures the financial independence of the organization from the government of the day and the pressures of commercial advertisers. Let’s say for example that NewsComm was able to amass a $20 billion endowment (roughly equivalent to the United States spending half of the GDP per capita that the BBC spends annually). 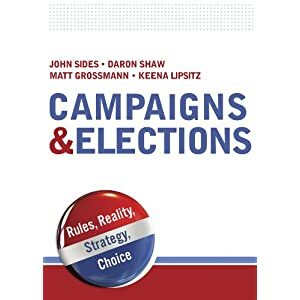 Spending 3 percent annually would create a budget of $150 million to spend on capital needs and employees while leaving $450 million to spend annually on advertising space – roughly the amount of a major presidential campaign. True, it’s difficult to present in-depth stories with nuance in 30 to 90 seconds, but in an age of Twitter, these challenges already exist across all news media. They are also partially surmountable – look at the masterful short posts on places like Wonkblog or Economix in traditional media outlets. The NewsComm method also has several advantages. First, unlike news broadcasts, NewsComm stories can be run multiple times across multiple outlets – for days if necessary. Second, because the stories would have to be produced in advance, they would have to focus on ongoing policy debates instead of chasing the latest scandals and frivolity. Perhaps NewsComm is gimmicky. But as the fragmenting media market decreases the audience for public broadcasting, we need to find new ways to provide the knowledge that citizens need to hold elected leaders accountable. And if an advertiser can promote one ridiculous trick to cut 15 percent of your belly fat in a week, wouldn’t it be great if we could use this one ridiculous trick to boost political knowledge of citizens by 15 percent in a year? I think that the fact that the polls say Americans are wary in Syria does not mean all that much. 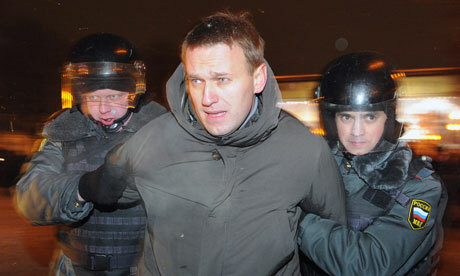 If the Obama administration is able to do something that has a decisive effect, they will look like heroes. And if they look impotent in their use of military force, it will rebound against them. But the polling numbers showing American reticence, as of right now, doesn’t add up to much, because it’s really not a salient issue. It’s not enough to look at the numbers of people opposing intervention; you have to look at how much people care and at this point it isn’t very high on the list, as of today. That can change if things escalate and it starts to look like a “real” war, as opposed to Libya — which was obviously real if you were there — but from the United States the perspective was that no Americans were on the ground and no American planes were being shot down. If Syria looks like that, the pubic won’t get all that engaged. It would potentially be foreign policy success for the Obama administration, though coming awfully late, after a lot of horrible things have happened there. But if it doesn’t go well and America is gradually sucked in — throwing good resources after bad — eventually it could become a big political liability, and you could get significant public engagement. This could have happened in Afghanistan, too, if more Americans started getting killed. But it hasn’t escalated in that way. From an interview with Matthew Baum at Journalist’s Resource. More here. How to Explain the Seeming Gap between Public Opinion and Immigration Reforms in Congress? Continuing our new series of collaborations with political science journals, we are pleased to present the following guest post from University of British Columbia political scientist Gyung-Ho Jeong to discuss his article “Congressional Politics of U.S. Immigration Reforms: Legislative Outcomes Under Multidimensional Negotiations” that appears in the current issue of Political Research Quarterly. In conjunction with this post, Sage Publications will make the article freely available to all for the next 30 days; you can download it here. According to Gallup polls, less than a quarter of the American public supports expansive immigration policies, while more than three quarters of people prefer the status quo or more restrictive policies. However, as illustrated by the past legislation (and recent debates) over the legalization of undocumented immigrants and increased level of legal immigration, immigration reforms tend to produce legislative outcomes that are not consistent with public opinion. Why? While the conventional view explains this gap by citing the dominant role of organized pro-immigration interest groups—such as business interests and ethnic groups—in immigration policymaking, in a current article in Political Research Quarterly I present an alternative view that focuses on the nature of immigration debates in Congress. Examining the politics of immigration reform in 1986, Artistide Zolberg observed that the conflict over immigration created “strange bedfellows” that cut across the ideological alignment of left and right. The reason is that immigration affects two different sets of concerns: economic and social/cultural. Economically, immigration affects the supply of labor, creating conflicts of interest between employers and employees. 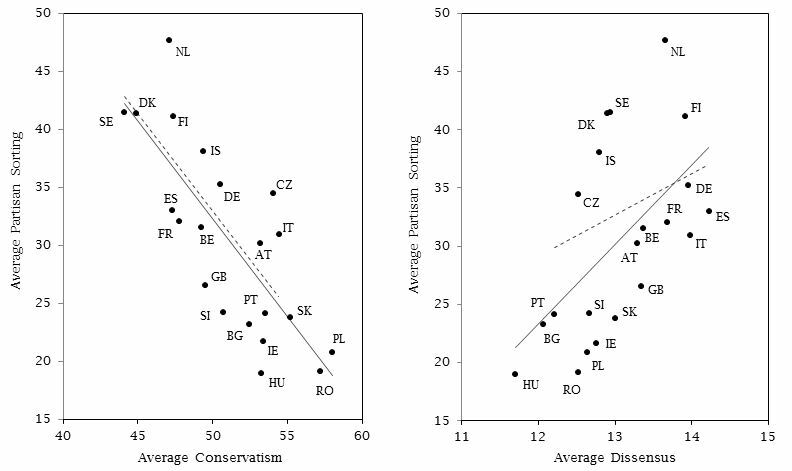 Socially, immigration affects national identity, culture, and ethnicity, pitting social liberals against social conservatives. In this article, I take this multidimensionality of immigration politics as a starting point to explain the gap between public opinion and legislative outcomes. In short, I demonstrate that the multidimensionality of immigration debates has allowed minorities of legislators to increase their influence by alternately forming coalitions with different groups. This has contributed to the seeming gap between public opinion and legislative outcomes even when legislators were not captured by pro-immigration groups. This is a guest post by political scientists Bethany Albertson and Shana Kushner Gadarian. The immigration reform bill that the Senate passed has stalled in the House. As members of Congress head home to their districts over the recess, pundits speculate about whether August 2013 will reprise the heated town halls of 2009. The public is divided on the Senate’s bill, which included both a path to citizenship and increased border spending, with 55% of Democrats supporting it and 62% of Republicans opposed. Some proponents of immigration reform express renewed optimism, while others see reform prospects as doomed. Mark Kennedy, a former Republican member of Congress, argues that immigration will be won or lost over the August recess. In a policy area that is often surrounded by emotional rhetoric, the prospects for reform depend, in part, on the emotional tenor of the debate. A debate that generates anxiety tends to favors opponents of comprehensive immigration reform. Anxiety about immigration leads both Democrats and Republicans to trust the Republican Party to handle immigration and to support a more restrictive immigration policy. As part of a forthcoming book on anxiety and politics, we conducted an experiment in which we showed people an anti-immigration advertisement modeled on California Governor Pete Wilson’s 1994 advertisements. The ad highlighted three main concerns about immigration: that immigrants take American jobs, that open borders bring crime and threaten national security, and that immigrants take healthcare, education, and welfare funding from Americans. Although every person heard the same message, we varied the music and visuals. One version of the ad had threatening visuals and scary music, while the other vision had neutral visuals and no music. We expected that the threatening music and images would increase respondents’ level of anxiety, and that is what happened. Anxious people seek reassurance, and because the Republican Party is traditionally seen as stronger on immigration, anxiety drove citizens toward Republicans. 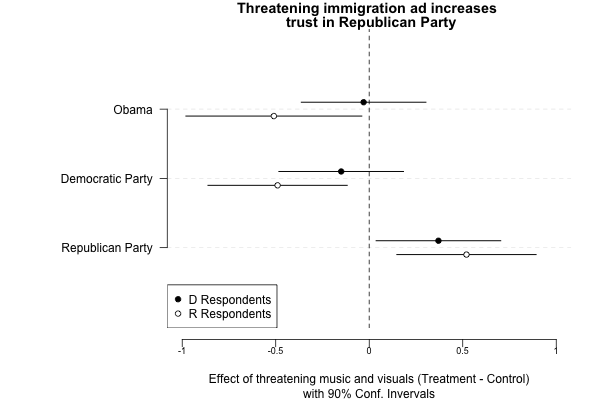 After watching the ad with the threatening music and images, both Democrats and Republicans expressed more trust in the Republican Party to handle immigration, relative to the group that saw the other ad. Republicans also expressed less trust in both Obama and the Democratic Party. When Americans are anxious about immigration, our research shows another consequence: that they also become more supportive of more punitive immigration policies, including making immigrants ineligible for public services as well as increased spending on border security. What does this mean for supporters of comprehensive immigration reform? It will not be easy to change the fact that Republicans are seen as owning the issue, nor will it be easy to prevent opponents from trying to stoke anxieties about immigrants. Better options for supporters are to focus on the economic benefits, which could make for a less emotional debate, or to produce a different emotional narrative, perhaps one that focuses on the plight of some immigrants. Other research shows that evoking humanitarian concerns makes people more sympathetic to immigrants—and that these concerns can even override perceptions of threat.